Small yet spacious; sleek yet tough: the Numarine 26XP proves you absolutely can have the best of both worlds. 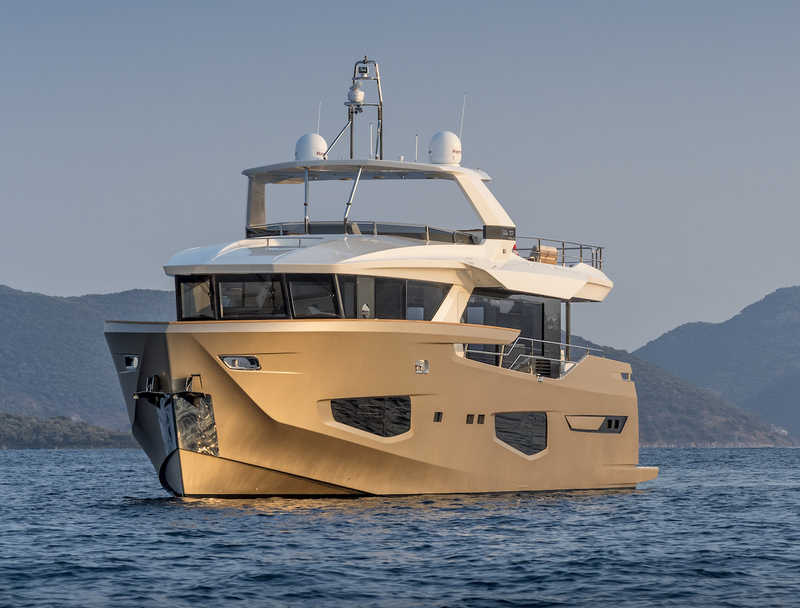 Minella is the second Numarine 26XP, but the first built on the full displacement hull. This is a yacht built by a yard with its finger firmly on the pulse of modern yachting habits: the explorer market is roaring, but it is still a buyer’s market, and flexibility and customisation are top priorities for potential owners. Numarine’s founder and CEO Omer Malaz and his team have have developed a platform for a yacht that they believe covers all the bases. “The market is moving in the explorer direction, and very strongly,” he says. And he should know, because Minella in fact belongs to him, which goes some way to showing the confidence he has in the yard and its products. The 26XP has two different hull configurations, planing and full displacement, and offers four different engine set-ups. Through this luxury of choice, Malaz hopes to cater to a wider audience: “I believe there are two kinds of buyers, one that loves the looks of the rugged SUV design and all the volume it offers but doesn’t need to travel very far. The other type likes the looks, but mainly wants to take their yacht on long distance voyages,” he says. 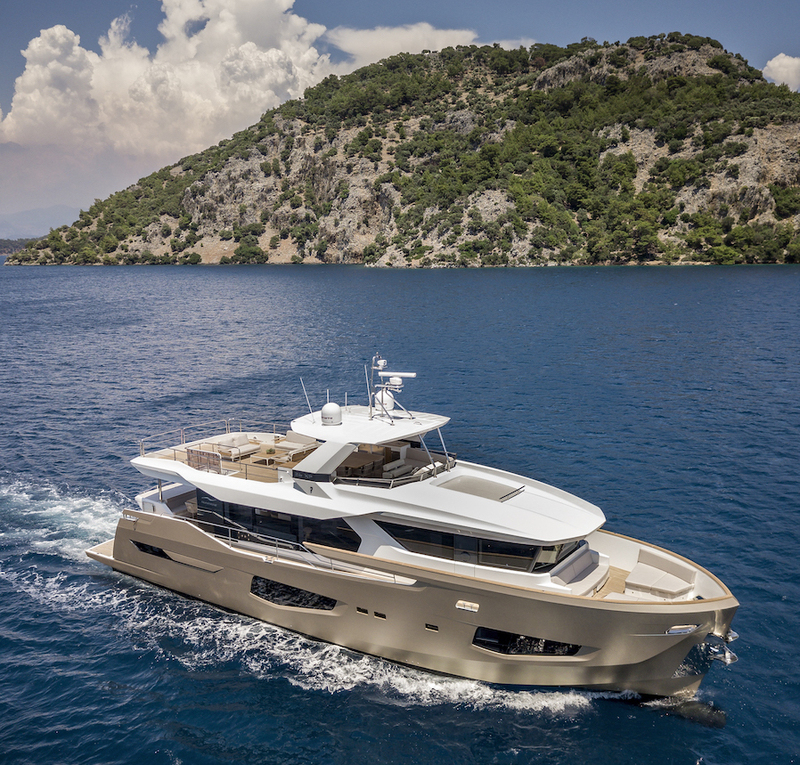 “This is why we have two different hulls, one which is a planing hull where you have the fast speed, aimed at a more typical motor yacht buyer, and then there is the displacement version, which offers the long range and the fuel economy.” And Minella certainly has range, 3,000 nautical miles of it at nine knots to be precise. Inside, Minella is as modern as the thought process that went into her development. Clean, practical and bright, the saloon is free of much of the traditional fixed, bulky furniture and feels much larger than on yachts of comparable size. 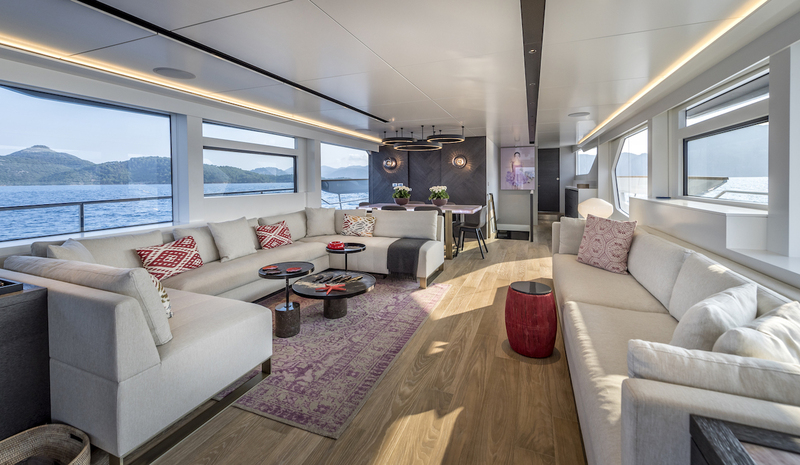 The Numarine trademark huge windows in the saloon have large opening sections, allowing a breeze to float through the space. Malaz’s wife was very involved with the interior design, and personal touches give pleasure but don’t detract, such as the backlit pink marble dining table. Down below are four guest cabins: a master amidships, a double and a convertible twin further forward and a VIP in the bow. 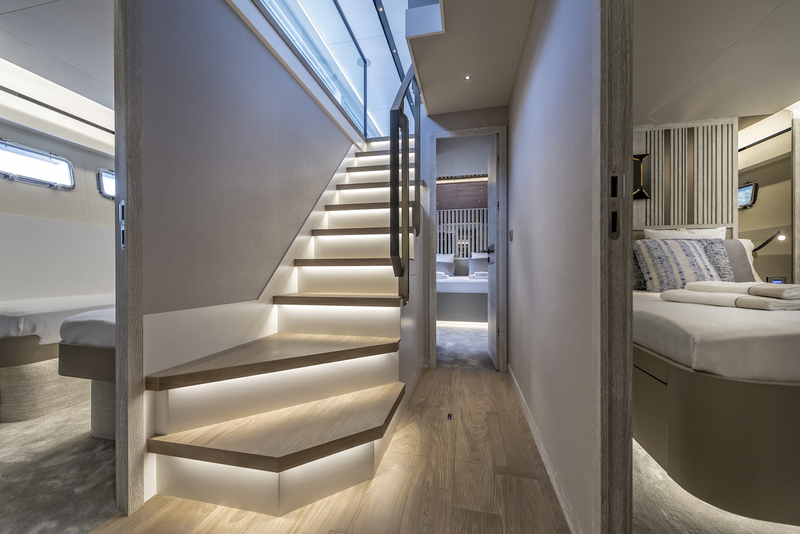 Numarine has started experimenting more with their interiors, with the choice of finishes on offer expanding every year, and myriad woods, marbles and leathers that the in-house team can weave together to create a bespoke and personal finish. On Minella the style is contemporary yet homely, with calming neutral hues, tinted mirrors and pops of modern artwork. The full beam owner’s cabin is certainly impressive, with large windows for plenty of natural light, and clever space-saving design features, such as the television within the mirror. A Numarine staple large bathroom and a walk in closet complete the space. What is perhaps most impressive on board Minella, however, is what you are not aware of, and deliberately so. Putting his expertise as an owner into action, Malaz made sure that the XP series of yachts would feel good, as well as look good. He understood that an XP client would expect cruising options, such as travelling at night, and that noise and vibration would be deciding factors. Lithium ion batteries mean the yacht can run for 18 hours in ‘night mode’ with no generator, before needing to be recharged. In the master cabin while cruising, the noise levels are a tiny 55 dB(A). At anchor with the generator and AC on, these drop even lower, to only 30 dB(A). On top of this is extensive soundproofing, such as foam pads between the ceiling and the deck above to dampen footsteps, and the interior walls are made by a German company that sandwiches foam between two panels of wood to absorb any extra noise and vibration. “The 26XP offers any and everything an experienced boater wants,” says Malaz. 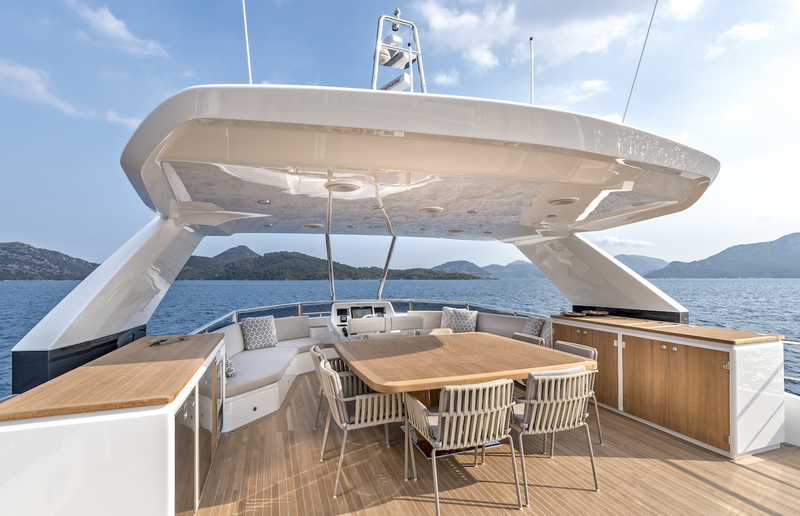 The flybridge is indeed a big draw, with freestanding furniture highlighting the amount of space on offer, which, at 55 metres squared, is certainly ample. Numarine offer it with or without a crane for tender storage. Minella doesn’t have a crane, and instead uses the whole space for relaxing and partying. Amidships there is a large dining table and a wet bar with a barbecue and grill for al fresco dining. One of the most interesting spaces up here though is the helm station. 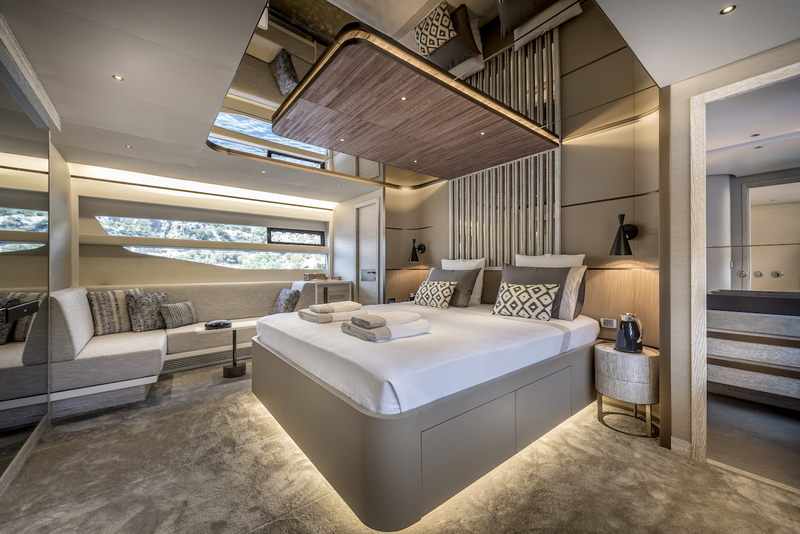 As an owner-operator, Malaz wanted to make sure there was plenty of lounging space near the helm so that an owner could drive while still socialising with friends and family, an often-ignored detail he discovered on other yachts. Minella did extensive cruising for her first season, a shakedown on the way to the Cannes Yachting Festival. “We started from Istanbul, sailed direct to Göcek, then up the Turkish coast to Bodrum,” says Malaz. “Then on to the Greek islands, where we received special attention in Mykonos, being so out of the ordinary style-wise. After that we passed through the Corinth Canal and visited Kefalonia, Paxos and Corfu, then sailed down to Italy, Sicily, Sardinia and ended up in Cannes.” And it seems like it was certainly worth the trip. After the Cannes show, Minella went to Palma de Mallorca for transport to Florida, where she will attend all the major local boat shows over the next few months. During the downtime, Malaz has plans to enjoy his yacht and explore the warm waters of the Caribbean and the Bahamas. In the most complimentary sense of the word, the Numarine 26XP has been over-engineered. “Our boats are geared for the part of the world in which they’re built in, the deep rough sea of the Aegean,” says Malaz. The 26XP has many redundancies, two anchors being one of them. As an explorer yacht, Numarine went on the assumption that an owner will want to go off the beaten track where there often won’t be much in the way of services or support. The iPad allows you to access various systems, such as switching on the generator, the pumps and even turning on the lights. This makes the 26XP flexible in terms of owner usage, as you can be hands off and have the maximum crew, or be able to do a lot of it yourself with minimal crew. The Numarine 26XP might not be the largest explorer superyacht, but she’s nothing short of an architectural heavyweight in her category. Clever use of volume, massive external space and intelligent internal systems await behind her really rather good looks. They combine to create a superyacht that is just as happy exploring the furthest corners of the oceans as cruising leisurely down the coast on a weekend jaunt.